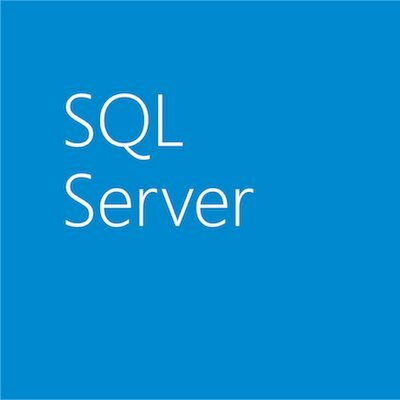 Although SQL Server 2016 runs faster, SQL Server 2017 promises to run even faster and empower customers to run smarter with intelligent database features like the ability to run advanced analytics using Python in a parallelized and highly scalable way, the ability to store and analyze graph data, adaptive query processing, and resumable online indexing allowing customers to deploy it on the platform of their choice (Windows or Linux). SQL Server is one of the most popular DBMS among the SQL community and is a preferred choice of RDBMS among customers and ISVs owing to its strong community support. In SQL Server 2017 CTP 2.0, we have released several customer delighters and community-driven enhancements based on the learnings and feedback from customers and the community from in-market releases of SQL Server. Smart differential backup – A new column modified_extent_page_count is introduced in sys.dm_db_file_space_usage to track differential changes in each database file of the database. The new column modified_extent_page_count will allow DBAs, the SQL community and backup ISVs to build smart backup solutions, which perform differential backup only if percentage changed pages in the database are below a threshold (say 70 to 80 percent), otherwise full database backup is performed. With a large number of changes in the database, cost and time to complete differential backup is similar to that of full database backup, so there is no real benefit to differential backup in this case; instead, it can increase database restore time. By adding this intelligence to the backup solutions, customers can now save on restore and recovery time while using differential backups. Consider a scenario where you previously had a backup plan to take full database backup on weekends and differential backup daily. In this case, if the database is down on Friday, you will need to restore full database backup from Sunday, differential backups from Thursday and then T-log backups of Friday. By leveraging modified_extent_page_count in your backup solution, you can now take full database backup on Sunday and let’s say by Wednesday, 90 percent of pages have changed, the backup solution takes full database backup rather than differential backup since the time and resources consumed remain the same. If database is down on Friday, you will restore the full database backup from Wednesday, small differential backup from Thursday and T-log backups from Friday to restore and recover the database much quicker compared with the previous scenario. This feature was requested by customers and community in connect item 511305. Smart transaction log backup – In the upcoming release of SQL Server 2017 CTP, a new DMF sys.dm_db_log_stats(database_id) will be released, which exposes a new column log _since_last_log_backup_mb. The column log _since_last_log_backup_mb will empower DBAs, the SQL community and backup ISVs to build intelligent T-log backup solutions, which take backup based on the transactional activity on the database. This intelligence in the T-log backup solution will ensure the transaction log size doesn’t grow due to a high burst of transactional activity in short time if the T-log backup frequency is too low. It will also help avoid situations where default periodic interval for transaction log backup creates too many T-log backup files even when there is no transactional activity on the server adding to the storage, file management and restore overhead. Tempdb setup improvements – One of the constant pieces of feedback from customers, the SQL community and the field after doing the SQL Server 2016 setup improvements is to uplift the maximum initial file size restriction of 1 GB for tempdb in setup. For SQL Server 2017, the setup will allow initial tempdb file size up to 256 GB (262,144 MB) per file with a warning to customers if the file size is set to a value greater than 1 GB and if IFI is not enabled. It is important to understand the implication of not enabling instant file initialization (IFI) where setup time can increase exponentially depending on the initial size of tempdb data file specified. 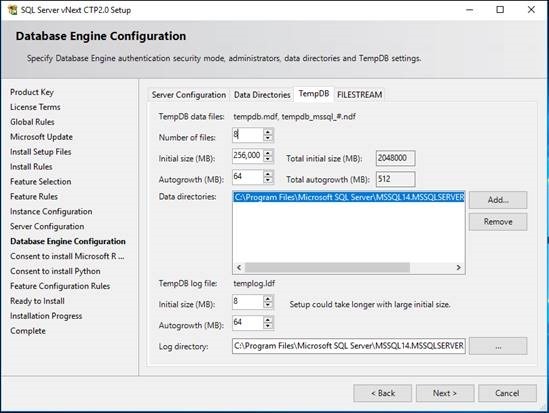 IFI is not applicable to transaction log size, so specifying a larger value of transaction log can increase the setup time while starting up tempdb during setup irrespective of the IFI setting for the SQL Server service account. Tempdb monitoring and planning – A few months back, the SQL Server Tiger team surveyed the SQL community to identify common challenges experienced by customers with tempdb. Tempdb space planning and monitoring were found to be top challenges experienced by customers with tempdb. As a first step to facilitate tempdb space planning and monitoring, a new performant DMV sys.dm_tran_version_store_space_usage is introduced in SQL Server 2017 to track version store usage per database. This new DMV will be useful in monitoring tempdb for version store usage for DBAs who can proactively plan tempdb sizing based on the version store usage requirement per database without any performance toll or overheads of running it on production servers. Transaction log monitoring and diagnostics – One of the highly voted connect items and highly requested requests from the community is to expose transaction log VLF information in DMV. T-log space issues, high VLFs and log shrink issues are some of the common challenges experienced by DBAs. Some of our monitoring ISVs have asked for DMVs to expose VLF information and T-log space usage for monitoring and alerting. A new DMV sys.dm_db_log_info is introduced in SQL Server 2017 CTP 2.0 to expose the VLF information similar to DBCC LOGINFO to monitor, alert and avert potential T-log issues. In addition to sys.dm_db_log_info, a new DMF sys.dm_db_log_stats(dbid) will released in the upcoming CTP release of SQL Server 2017, which will expose aggregated transaction log information per database. We will share more details on this DMF once it is released. Improved backup performance for small databases on high-end servers – After migrating an existing in-market release of SQL Server to high-end servers, customers may experience a slowdown in backup performance when taking backups of small to medium-size databases. This happens as we need to iterate the buffer pool to drain the ongoing I/Os. The backup time is not just the function of database size but also a function of active buffer pool size. In SQL Server 2017, we have optimized the way we drain the ongoing I/Os during backup, resulting in dramatic gains for small to medium-size databases. We have seen more than 100x improvement when taking system database backups on a 2TB machine. More extensive performance testing results on various database sizes is shared below. The performance gain reduces as the database size increases as the pages to backup and backup IO take more time compared with iterating buffer pool. This improvement will help improve the backup performance for customers hosting multiple small databases on a large high-end server with large memory. Processor information in sys.dm_os_sys_info – Another highly requested feature among customers, ISVs and the SQL community to expose processor information in sys.dm_os_sys_info is released in SQL Server 2017 CTP 2.0. The new columns will allow you to programmatically query processor information for the servers hosting SQL Server instance, which is useful in managing large deployments of SQL Server. New columns exposed in sys.dm_os_sys_info DMV are socket_count, core_count, and cores_per_socket. Capturing query store runtime statistics in DBCC CLONEDATABASE – DBCC CLONEDATABASE has proved to be extremely useful in exporting the query store metadata for regression testing and tuning. DBCC CLONEDATABASE didn’t capture the runtime statistics, which is flushed every 15 minutes and which required customers to manually execute sp_query_store_flush_db before running DBCC CLONEDATABASE to flush and capture query store runtime statistics in database clone. Starting with SQL 2016 SP1 CU2 and SQL Server 2017 CTP 2.0, DBCC CLONEDATABASE will flush runtime statistics while cloning to avoid missing query store runtime statistics in database clone. In addition, DBCC CLONEDATABASE is further enhanced to support and clone Full-Text indexes. We also fixed several bugs caused when cloning databases using some of latest features (AlwaysEncrypted, RLS, Dynamic data masking, temporal) and released the fixes in SQL Server 2016 SP1 CU2 and SQL Server 2017 CTP 2.0. Thanks to all SQL community members for sharing your feedback and making SQL Server a preferred choice of RDBMS for customers.